Port Blair, May 1: The swimming pool at Netaji Stadium is abuzz with activities as a large number of swimming enthusiasts are seen in this campus these days. This is because of the swimming coaching class that is presently underway in this complex. The Directorate of Youth Affairs and Sports is organizing summer vacation hobby classes for the students in an assortment of activities in Netaji Sports Complex now a days. A vast number of students have enrolled themselves for different classes. However, the summer swimming classes are drawing most learners. The classes that were inaugurated on Apr 18 are going on in full swing. Recently, the Director, YAS, Shri Lucas Robert visited the swimming pool to see for himself what the children have learnt so far. During his interaction with the swimmers, persuaded them to learn swimming safety measure as well as groom it further at professional level. He also explained the participants about the membership procedures and its benefits in the Netaji Sports Complex here. Some of the parents were also present on the occasion. 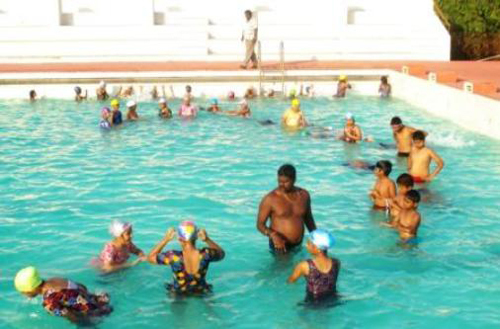 This summer season, children within 14 year age group are learning to swim in the swimming pool in four batches, said the Swimming Coach Shri Selvam. The learner has to be at least 4 feet tall to be able to be in the swimming pool, he informed.